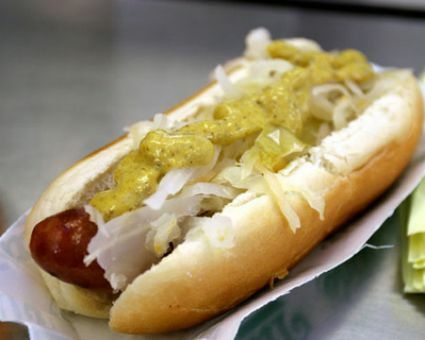 Milwaukee may be synonymous with beer dynasties and The Fonz, but when bratwurst was introduced in 1953 at the Milwaukee County Stadium, "brats" became instant sports stadium fare. After the visiting Brooklyn Dodgers' Duke Snider brought brats back to NYC, national interest ensued. We grill the delectably heady sausage link to charred perfection. Then, we top it with sauerkraut and mustard for a wonderful tangy kick. Tip: Watching Happy Days reruns will enhance your dining pleasure.